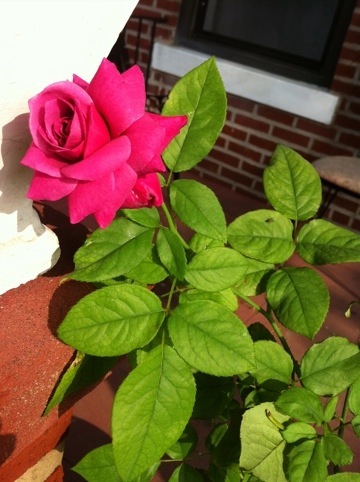 In addition to being in love with my partner, it turns out I really like raising roses. She’s a diva bush, no doubt. More demanding than me. And that’s saying a lot. But, wow, she makes me smile in the morning when she’s gone and worked up a show. Cheeky bushy. Wow, really nice rose there. Do they require any kind of special care, or a lot of water? When I first moved here there was a rose bush in the corner of the yard. I hadn’t gotten back into gardening mode at the time and eventually it died. Have you ever tried eating one? I recall hearing that at least some of a rose is edible. Come to think of it, it may have been on a podcast called ‘The mad herbalist’. One day I’ll try to put together a list of podcasts I listen to. It’s probably about 2 dozen but they’re not all about gardens. There is lots of info to sift through on this site and it’ll take a while to digest it to the point of making a final decision on how to set something up that will work the way I want. I am beginning to wonder if a water barrel setup will be practical, looking at the lack of rain to keep it filled. I will have to keep track of how much water I actually use in my containers per day to see what size barrel I might need to make that work for a week unattended. Originally I was thinking of running the main supply line under the top rails of the deck with the watering hoses coming down to the containers. Now I am thinking the supply line may be better off under the deck with the small watering hoses coming up between the deck boards. Either way the majority of hose will be kept out of sight. Well, I am just typing out loud here with almost everything subject to change as I learn more. ANY ideas would be appreciated.